Publicamos aqui o relato da viagem à Eslovénia, na versão do Nuno Gonçalves, em Inglês, língua usada por todos os participantes no projecto Erasmus+. Last 18th march, Nuno Gonçalves, Pedro Sousa, Francisco Faria, André Silva, Catarina Bastos and Sofia Sarmento, accompanied with the teachers Ananbela Torre, Ana Simão, Conceição Lages e Ernestina Ferreira, arrived to Sá Carneiro Airport, in Oporto, at 4:30 a.m. to begin this fantastic adeventure. The plane flew to London and after that to Ljubljana, the capital city of Slovenia. We stayed in the Central Hotel, in Ljubljana, on the first night. There, we ate some typical foods from Slovenia and visited some monuments. 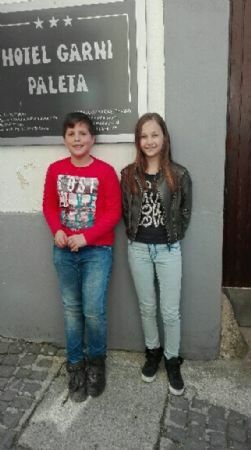 On Sunday afternoon, we left the Capital and went to Skofja Loka, by bus, where we met the boys and girls and their families, who we we stayed with all the week. Every day we went to school with our Slovenian friends, where we did many different activities. There, we learned about Slovenian history and culture and t some traditional games. We, Portuguese pupils, also taught them about our country, city, school and traditional games and all together we played them with Slovenian, Italian and Turkish pupils. During this week, we visited awsome places, with beautiful landscapes such as Ljubljana, Skofia Loka, Piran, Postojna Jama and Bled. On 25th march, we came back to Portugal, with “our suitcases full of knowledge” and many adventures to tell. We liked the trip very much, because it was a new experience for all of us, going to a different country, without our families, meeting and learning about other cultures - Slovenian and a little about Italian and Turkish cultures, too. It was very important, too, because we always had to communicate in English. Would you like to have a similar experience? Join in the ERASMUS+ project!